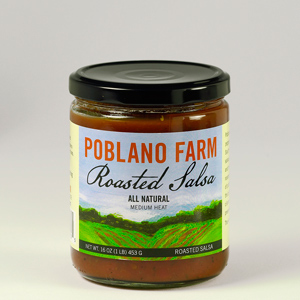 Our Roasted Salsa is the original salsa at Poblano Farm. It's made from poblano peppers, the namesake of our farm. We fire roast the peppers for a naturally sweet flavor, combine them with ripe tomatoes, and add jalapenos for a touch of heat. The result is a salsa with perfect medium heat and a delicious authentic Mexican flavor. Plum tomatoes, roasted poblano peppers, jalapeno peppers, water, fresh onions, cider vinegar, cilantro, sea salt, citric acid. Our Chipotle Salsa is a classic Mexican salsa and our hottest, we call it medium plus. Its unique flavor is the perfect balance of sweet ripe tomatoes and the rich, smokey, spice of the chipotle pepper. This is a naturally sweet salsa with bold chili flavors and a distinctive late heat. Plum tomatoes, chipotle in adobo(chipotle peppers, ancho peppers, vinegar, tomato, salt, spices) jalapeno peppers, water, fresh onions, cilantro, sea salt, citric acid. 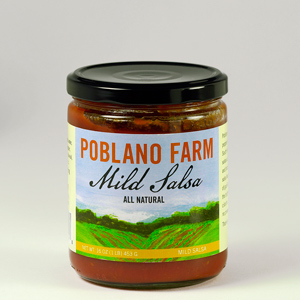 Our Mild Salsa is made from guajillo peppers, a sweet red pepper with lots of flavor and minimum heat. The combination of red ripe tomatoes and guajillo peppers give this salsa its bright red color. It is sweet without adding sugar and has the delicious flavor of the guajillo pepper, the ideal chili for a true mild salsa. Plum tomatoes, vinegar, water, fresh onion, guajillo pepper, sea salt, fresh garlic, olive oil, cilantro, citric acid. 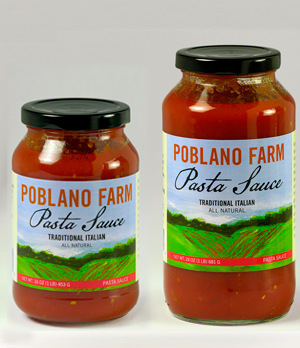 Our pasta sauce is inspired by traditional Italian flavors and fresh local ingredients. This classic sauce is made with the best sun-ripened tomatoes, extra virgin olive oil, fresh garlic and a touch of sweet basil. There are no onions or added sugars, only the tomatoes' natural sweetness. All natural ingredients with no preservatives. Plum tomatoes, water, extra virgin olive oil, fresh garlic, sea salt, fresh sweet basil, fresh parsley, red pepper flake, citric acid. We usually ship orders within 3 business days. If you have any questions about your order, please call us at (401) 261-5716. Shipping Charges: Our shipping charges cover the expenses we incur in processing your order, packing your purchased items, transportation and related overhead. Shipping Fees: 1-4 jars: $7.95 or 5-12 jars: $9.95 . For orders over 12 jars, please call us prior to placing an online order. Shipping Policy: All packages will be delivered without a required signature. We are not responsible for missing or stolen packages after they are delivered to the address or for packages returned or delayed due to incorrect or undeliverable addresses.